I didn’t sleep well the night before (I never do anyway!) panicking about how the morning would go! Both boys woke about 7. I think I managed to get showered and the 3 of us dressed and downstairs by about 7.45 so plenty of time for breakfast before we had to leave at 8.30. At home W sometimes has 2-3 breakfasts so he had cereal and then toast half an hour later to try and keep him full up! His bag was ready – a spare change of clothes in case of accidents, his packed lunch (which I’d made the night before) and then it was time to go! With W on the buggy board, we can walk to the school in about 20 minutes. My OH was able to join us which was lush… it was a lovely sunny morning. 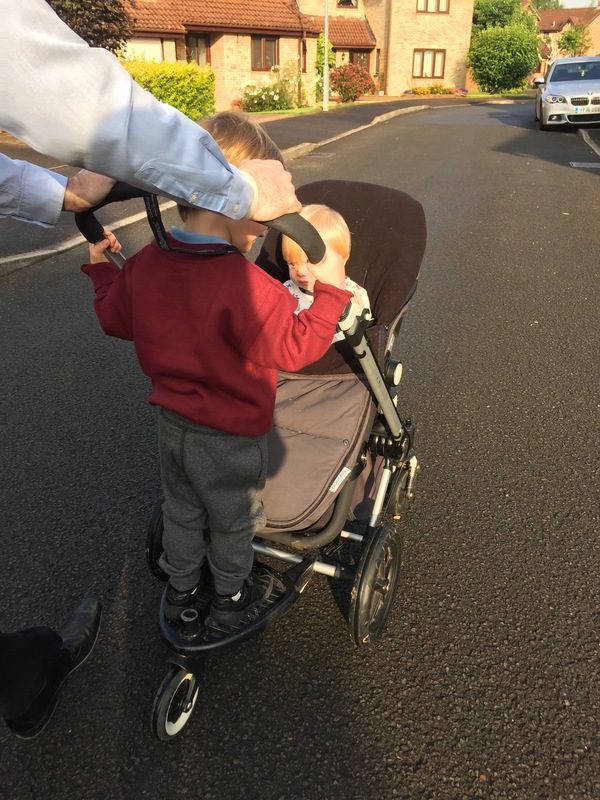 As we got closer to the school it was mad being part of the school run… parents and kids coming from all the side streets to join an ever-growing line towards the school… where did all these people come from?! At his class, the teacher/assistants come and meet the children at their own special gate to walk them into class. So after some family photos at the big event, it was time to say goodbye and off he went. He was fine. I knew he would be. He’s been with childminders since I went back to work at 9 months, and then playgroup last term. He’s never been overly-clingy. It must be so tough for parents who have been at home with their little ones this whole time! 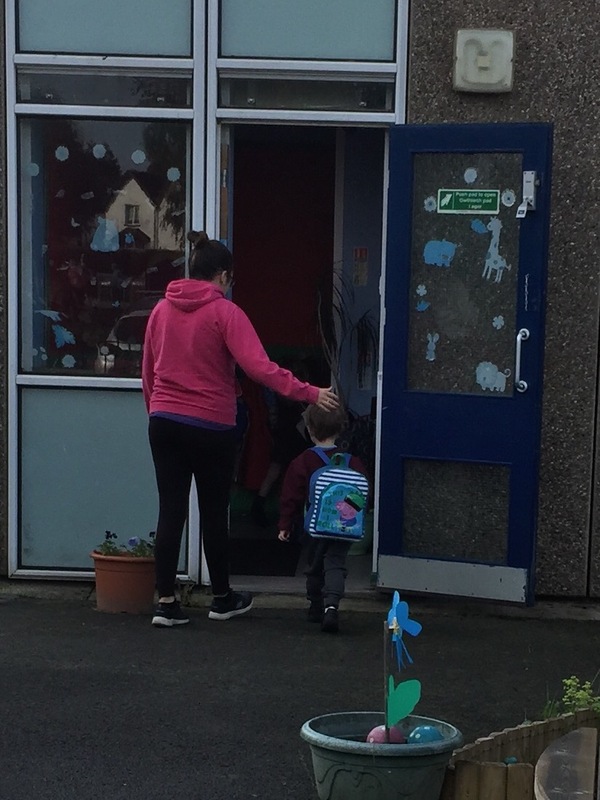 When his session finished at lunchtime, his Cylch meithrin came to pick him up, they walked over to Cylch meithrin where had his lunch and then spent the afternoon. They text me to say his morning had gone fine. I kicked myself afterwards for not driving past and stalking them for a look! When I picked him he was fine but tired. He wanted his dad but I bribed him into the car with a promise of his favourite cakes at home as it had been such a big day! I didn’t get much out of him about his big day other than he found it funny that there was another boy with the same name in his class! I’m not an overly sentimental person but I was hit by the enormity of yesterday! It’s the end of an era, and the start of a new one. W’s vocabulary, memory, independence have been great. Now we’ll watch him blossom with new skills like reading and speaking Welsh… and hopefully new friendships. I’m already worried about the years ahead where they might be falls-out, bullying and an upset little boy. I’ll be back in work next week and I’ll only get the do the school run on Fridays. I’m sure I’ll treasure those Friday school runs! As I said W is independent but he still needs help getting dressed, wiping his bum etc. He still loves a catch and sitting on my lap to watch TV (on his terms obviously). At the moment he likes me being there when he falls asleep. He joins us in bed during the night. He still needs us, and wants us. It’s sad to know that eventually he won’t. I guess the enormity is…. our little boy really is growing up! Can’t we just pause the world and stay hear a while?! Next Next post: REVIEW: Cocobubble – dinosaur bath-time fun for kids!